The Medibuntu repository was discontinued and is no longer available. As a consequence, you might see error messages in the Update Manager, Package Manager and Software Manager. Medibuntu provided us with additional codecs since 2006. It’s sad to see them go and we wish their maintainers the best of luck for the future. In Linux Mint 16 onwards libdvdcss2 (which allows us to watch DVDs) will be provided via a new Linux Mint repository at http://extra.linuxmint.com. Previous Previous post: Cinnamon 2.0 is out! This was driving me nuts. Thank you! Is the libdvdcss2 repository be available for Mint 13? Or should we use the repository that @sergio says? That thing did happen some days ago. Had to disable the medibuntu rep – just un-ticked the box in the sources list. Want to thank Serjio. I did exactly what he suggested. My Mint 13 Mate now gets complete updates. @ Sam: You can just keep the existing libdvdcss package installed. The package will not be removed, if you take away its package source. You may need to install Medibuntu keyring following commands. Thank you!, I have wasted a lot of time through not knowing why my software manager or update manager were not working?. Surely there is a better way of informing technically challenged users of of impending significant changes and how to handle them..
Edit by Clem: I’m all ears. News on the blog are there on your default Firefox start page and even as a default dynamic bookmark. It’s the best way for us to communicate with users without being intrusive. If you have an earlier, successful installation of LinuxMint13 you can use APTonCD to create a useful library of all your older packages and plugins etc for re-use. But: if I do so, all I see, is an empty document. What’s going wrong then?? And it is really sad to see medibuntu-repository go, because it did not only provide libdvdcss, it provided far more programms for Linux. Do I have to do anything then?? I do not want to loose my VLC-Player. It serves me good. So: what do I have to do?? Do I have to remove that?? This would be really sad then. Edit by Clem: If you’re running Mint 15 you’ve nothing to do. but can get no further because the apt-get update fails several times with the ‘Something wicked happened . . .’ message. Edit by Clem: Run Menu->Preferences->Software Sources and disable medibuntu. Alternatively check for files in /etc/apt/sources.list.d/ to see if one of them contains references to Medibuntu. Thanks, have very lttle knowledge of mint and I had no idea what was going on. No longer getting the warnnings. Hallo Mintkatze, I’m not Clem, but as Albert P. #’5 says: You can just keep the existing libdvdcss package installed. The package will not be removed, if you take away its package source. It’s the same with the keyring and the codecs. They will stay. Thanks for that. It was getting on my nerves when updating. That’s true. In fact having the keyring makes no sense if the repository is closed, but it can’t harm to keep everything installed. Here is a easy graphical way to do it using synaptic. If I recall correctly from topics about Medibuntu in Mint forums, Medibuntu repository wasn’t added in Mint 15, so you should be fine doing nothing. The full command has to be entered as root or with sudo preceeding it. I’m running LM 15 (Cinnamon) and mine gives me errors for medibuntu every time. I have never enabled any extra repos or anything…when I follow the instructions listed in the post, I get a blank source list file….What now? Read the post by “thebookkeeper”, there’s 4 terminal commands that he lists that does everything for you. Works like a charm…not sure how medibuntu ever got on my LM 15, I don’t add repos on this PC. My package manager and update manager have been broken for weeks, and this is the culprit. After going to Synaptic Package Manager, I was able to go to repositories and just remove anything that reference Medibuntu, which was just one entry, just like Clem said. All is right with the world now. And this also applied to my Mint 15 install. My question to Clem is, do you have any idea how two entirely separate systems running Mint 15 picked up that entry? I’m not discounting the fact that I somehow am forgetting that I did it myself, but I absolutely do not remember that, and I can’t figure out why on earth I would do that to begin with. What should I do so I can keep updating packages like java and adobe.. Without updating. linux 15 disables my internal wireless card and I couldnt fix that issue. Edit by Clem: Hi Tony, simply remove the line “deb http://packages.medibuntu.org/ oneiric free non-free” and save the file. No more errors encountered by Update Manager regarding medibuntu. Edit by Clem: Ok, that’s not enough. I found out why some people running Mint 15 had Medibuntu in their sources. Mint 15 RC shipped with it. It was removed from mintsources (in version 1.1.5) between the RC and the stable release. The current version of mintsources in Olivia is 1.1.7, check your version with the command “apt version mintsources”. If it’s smaller than 1.1.5, update it with “apt install mintsources”. Thanks Clem, that explains a lot. I’m guessing certain aspects of medibuntu began shutting down since apt and update have been broken for several weeks in my Mint 15 systems? I think you’re right Clem, my desktop was on LM 15 RC in the beginning, and like I said in my earlier posts, I found an easy solution on the forums…that’s why I LOVE Mint so much – great user/dev support. 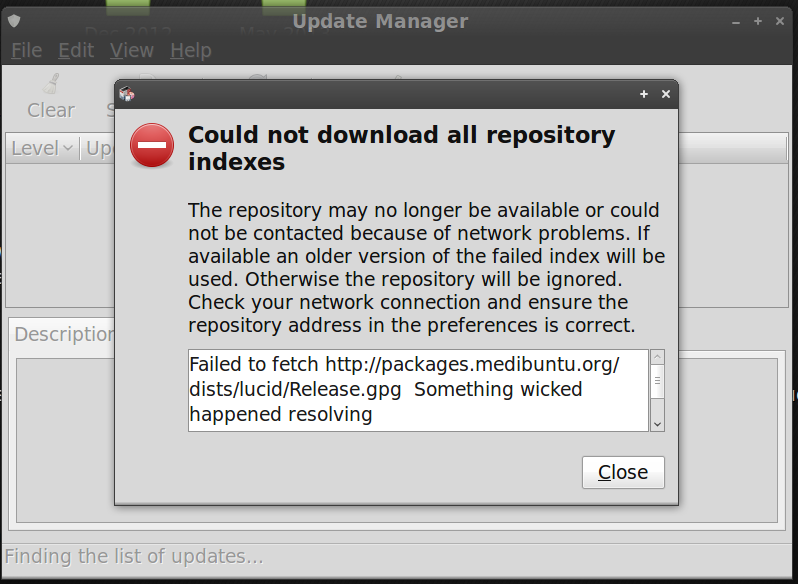 W: GPG error: http://archive.ubuntu.com precise Release: The …..
W: Failed to fetch http://archive.canonical.com/ubuntu/dists/precise/Release…. re: clem I did what you said and this popped up in my terminal after saving. nevermind everybody.. Apparently I forgot to type in the apt update code afterwards. My laptop is doing better now, guess all the packages needing update ran under medibuntu. kelebek333: should you add deb http://mirrors.ucr.ac.cr/medibuntu/ precise free non-free or the http://www.videolan.org/developers/libdvdcss.html link to LM13? Thanks alot, though it is late, but never toO late use it. Today this morning i saw it when i was installing compiz-setting. It is one of the things that has been giving me headache since i install Mint 13 MATE. I think you have to make clear on this command gksu gedit /etc/apt/sources.list, since i am using MATE,i have to type gksu pluma /etc/apt/sources.list in order to open and edit. The videolan repository offers the latest version of libdvdcss2. The medibuntu mirrors are unmaintained. Click OK, then in the upper right window corner click “Update the Cache.” Then update your libdvdcss2 using your favorite package manager. Regarding “My MintUpdate/Synaptic Package Manager/et cetera is broken” comments: They’re not, really, lol. Updates were still occurring, packages remained installable/removable; the apps just correctly reported the error(s) and continued to do their jobs. Rather than (solely) being an annoyance, this can and should be a lesson in what errors of this type mean and what to do when they occur. Therefore… no worries, lol. Clem: Continued thanks for Mint – with a special thank you for Mint XFCE. There’s no reference to Medibuntu but I still get the error message. Checked again. This time I wore my glasses! Oh yes it is! Getting loads of errors. How does one fix this in Mint 15? Not running 10, running 13, and glasses helped. I found the line, deleted it, and all is well. Now I have to find a group talking about sound problems (i.e., can’t use sound) on a Fujitsu UH900. Thanks for this solution. Try Clem’s response in comment #28 (updating mintsources). Or open Update Manager, click Edit>Software Sources. Click the PPAs tab and uncheck (or Remove permanently) all Medibuntu sources. I also only get an empty document. I’ve tried the command prefaced with sudo but it’s still an empty document. I’ve tried opening the file from the GUI and by right-clicking to force different programs to open it. Still just getting an empty document. How can I edit this? All right … But what about Linux Mint 16 ? I hope that problems such the dissapearing of the network connection after update will be history. I installed Mint 15, but after a few updates it was impossible to connect to the internet. Nothing helped. So, I deleted Mint (too bored to reinstall) and returned to something more reliable. What do you think, you can do something about (in any way you believe it is necesary, including by limiting some updates from Ubuntu) ? Only now do I get it … “medi” has nothing to do with medics, medicine, medical. It stands for ‘media’. Mediabuntu would have been a better(?) name – guess its too late for that idea. Been wondering about that for years – medical stuff in my Mint, why? Hopefully another repository will start to carry the updates as the affected packages are updated in future. I have Mint 13 KDE. None of the terminal suggestions worked for me. What did work was going into update manager>edit>software sources>other software tab and then uncheck the medibuntu line. Hi. I used the update using pluma as instructed om Mint 14 & 15 Mate versions. All worked well – thanks. I’d worked this out for myself, but I was wondering why a user-friendly distribution like Mint hadn’t told me. @Clem, I don’t use the default Firefox start page, and I expect that goes for many of us. After all there are thousands of users. Might there be some way in the future to send messages via the update manager? Or in some other way built into the system? In this case it didn’t terribly matter that my update manager looked unhappy till I worked out the problem, but might there be future issues you need to urgently communicate? Could be worth a bit of thought. Edit by Clem: I’d rather not get intrusive on how we communicate with users. The info is there on the start page, as well as in the default News dynamic bookmark and also on the blog itself. There’s many ways for people who are interested in following the news to catch them without us annoying those who don’t want them to be poked without asking to. That’s the reason we created Segfault as well, so we could deliver more news to interested users without annoying everybody. Same with donations, there are hints on the website and on the welcome screen, and that’s enough. Sure, we could get more donations or deliver news to more people if we were a bit more “in your face”, but that’s not why we’re making Mint in the first place. There’s a fine line to walk here and it’s important your computer is there for you to bring you what you need, but without getting in your way or catching your attention on things you didn’t show interest for. ch-ears …doing my loaf in and now fixed. Worked perfect after hours of trying other ways.